Now, don't get me wrong I loooooooove my naturally curly afro hair, having chemically straightened my hair previously for years I finally have come to adore the hair I was born with but sometimes I just like a change. Be it, crochet braids, head wraps or blue (yep, that's right I used hair chalk to rock a blue afro, it was messy! But I loved it) I just like to mix it up a bit and I fancied it straight for a week. I started with hair that I had washed a few days ago, so it was still well moisturised and not too tangled. The instructions on the KeraCare Pre-Poo Conditioner suggests detangling before washing which put the fear in me, I never detangle my hair dry. My hair loves water and is ten times easier to detangle when wet so I didn't want to start this process with really tangled hair. I started by sectioning my hair into four parts, saturated each section with the KeraCare Thermal Wonder Pre-Poo Conditioner (I needed one and a half packs) and began detangling with my Denman hair brush. I then twisted each section of detangled hair. 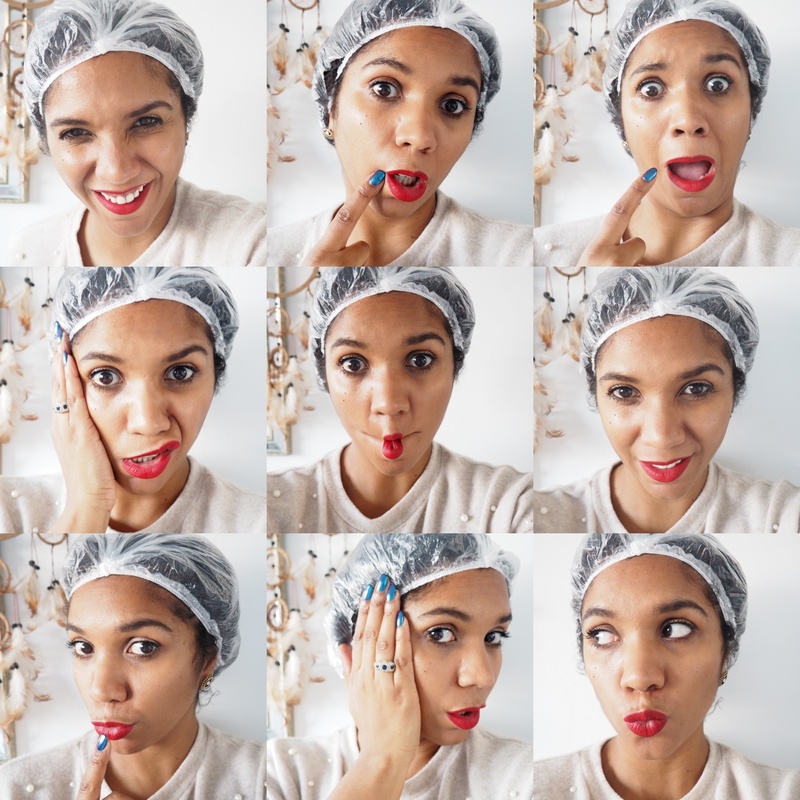 I then stuck on a plastic shower cap, pranced around taking loads of photos of myself in it as instructed (the shower cap and time, not the prancing!) I then rinsed out the Pre-Poo Conditioner and washed my hair twice with the KeraCare Thermal Wonder Cleansing Shampoo. I was totally thrown by not then using a conditioner afterwards, not even a leave in conditioner! but I wanted to follow the exact instructions. I then blotted my hair dry, in every video I watched on Facebook they mentioned how conditioned their hair felt at that stage, mine didn't. It definitely didn't feel dry but not as moisturised as the women in the videos had claimed, that could just be down to the condition of their hair. I have noticed during this process that my hair could do with a good trim so I need to do this! Next, I sectioned my hair again and sprayed quite a lot of Keracare Thermal Wonder 6 In 1 Thermal Protection to each section of my hair and blow dried on a medium to high heat using my comb attachment. I did notice that after I had blow dried my hair it felt super soft and light, it didn't feel weighed down or claggy at all. I would happily wear my hair at this stage, maybe put a few plaits in it for a wavy look but I really liked the volume at this stage. I then parted my hair into smalls sections, sprayed more of the Thermal Protector and used my very dusty GHD hair straighteners to go through my hair. I remember when my GHDs were life but honestly now I can't remember the last time I used them. At this stage and being totally honest I was impressed that the KeraCare Thermal Wonder could get my hair this straight, it is almost the same texture as when I use to chemically straighten my hair, however the real test for me was if it could take the elements without turning back. I'm not talking a rainy or particularly humid day, just a sunny autumn day, which it was. Directly after taking the above photo I rushed out to collect my little lads from school, I fully expected the afro to return but to my surprise it didn't! It wasn't as sleek as it was when I left the house but I actually preferred it as it had more volume. Every night I plaited my hair in two braids and woke up like the photo below, it wasn't straight but if I had wanted it to be I could have gone through with the hair straighteners again with larger sections but I quite liked this look. I did attempt a night out but the humidity was too much for my hair and by the end of the night it looked like the photos from after the blow dry. The final test was to see if my curls returned as normal after a wash and I can happily confirm I am back to a full head of curls. I will definitely use the KeraCare Thermal Wonder again when I fancy a change, next time I will probably stop after the blow dry stage and play with styles from there. So yes, I think it really does work on afro hair but I also think it depends on the condition of your hair, the better condition it is in, the better KeraCare Thermal Wonder will work for you.